What would we like for an initial lunar habitat. It should be as low mass as possible. It also should be as quickly and easily assembled as possible. It should be large enough to house the initial crew and should have a greenhouse large enough to provide for all of their caloric needs. It should be able to be covered with lunar dirt in order to provide protection for space radiation. 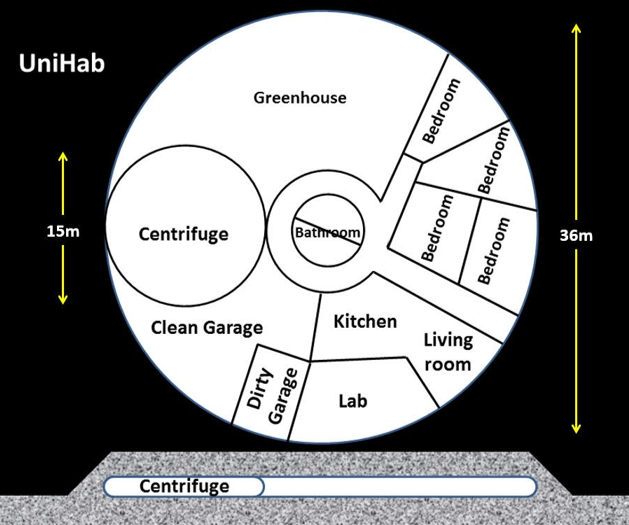 It should also have an indoor centrifuge to provide the crew with artificial gravity. Could all of these requirements be met by a single habitat delivered in a single payload? The "UniHab" concept is so named because it would provide for all of the needs of an initial crew of eight. It would also be unified in that it wouldn't consist of separate modules with weighty metal connectors but would be all one habitat. Its key feature is that it would be a very large inflatable which could be packed up into a single cargo module. It would also be relatively flat-roofed allowing for protective dirt to be placed on top without it sloughing off after inflation. The UniHab would be circular in layout. 35% of the area would provide the hydroponic garden volume needed to support a crew of eight. On a side away from the sleeping and living areas would be the indoor centrifuge providing the crew with artificial gravity. There would be four bedrooms for the four couples. Additionally, there would be living and work areas. Both the inner and outer walls would be flexible allowing for the whole habitat to be a folded, compact payload prior to launch. Prior to the arrival of the UniHab, telerobots would rake a relatively flat area of rocks, use a laser levelling system to grade the ground flat, and then compress the fluffy dirt to a hard "foundation". The UniHab would be delivered as a singular cargo module by a Xeus lander. A telerobot would wheel the compressed UniHab bundle to the center of the prepared area and snip the bundle's ties. Then, a container with a modest amount of condensed air would be activated to inflate and hence unfold the UniHab. It would not take much air pressure to unfold the UniHab against the Moon's vacuum. After being unfolded, the UniHab would be vented flat and the telerobots would push the surrounding lunar dirt on top of the deflated UniHab. The telerobots would be operated 24/7 to push as much lunar dirt on top as needed. Subsequently, more condensed air would inflate the UniHab to 1/2 atmosphere's pressure easily pushing the lunar dirt up. In fact, air pressure is so great, the UniHab would need indoor tethers to keep the roof relatively flat. This comes to one centimeter diameter Kevlar tethers every 10 feet. After full inflation the telerobots would push dirt on the sides of the habitat thereby giving it full shielding. Finally, the telerobots could bring in certain pieces of equipment and install them if they were not already inside the UniHab. With precious little "construction" the UniHab would have been set up and ready for the crew's arrival as a turn-key habitat. Inflatable space habitats are at a high level of development. There are already three flying in space now (TRL9). Several inflatables in low Earth orbit have been at risk of being struck by micrometeorites and orbital debris. But those that were placed in orbit survived for several years without rupturing. The risk of the UniHab being puctured by a micrometeorit prior to crew arrival is statistically miniscule. Yes, the UniHab could rupture creating an emergency. But it would be constructed of very tough materials (e.g. Kevlar), have multiple air-proof layers, and sensors to detect small ruptures (see the work at U. Maine). Most ruptures would be small and would provide the crew with plenty of time to either fix the leak or casually exit the Unihab. Additionally, the UniHab could be designed with inflated, sectioned support beams so that no single puncture would bring down the habitat. Yes, 3D printers could be used to construct a habitat prior to crew arrival. But it seems that the inflatable approach would be much quicker, require less power, and would be less likely to suffer breakdowns during "construction".